Extreme Improv is fast paced competetive improvised sketch comedy show from Sparky Buddy Productions! Blending short form improv with stand up and game show style elements in a WWE style competeive comedy free for all, the show has gone international, with Extreme Improv performances across the world in mainland Europe, Asia and North America! The show takes traditional short form improvised theatre and pushes limits with extreme twists and innovations making it the most challanging and ridiculous improv sketch show on the planet! When you see Extreme Improv in action you get a incredibly funny, hugely audience interactive show which gives every audience a unique and hilarious comedy experience every single night! Created by Sparky Buddy Productions director David Pustansky, the show includes many brand new improv games created specifically for Extreme Improv. And what's more where we do play classic games we load them up with 'extreme twists' to make them unlike anything you will have seen on Whose Line Is It Anyway? or any other improv show in town! In Extreme Improv you'll see fearless performers challenge brand new games such as Verbatim, Kazoosical, and the Gemini Scene! We also put brand new spins on classic improv games such as Theatre Styles, Alphabet Scenes and Singing games to make them extreme...to the max! And unlike most other improv shows, Extreme Improv has a true competeive edge! Our performers go to comedic war with each other to see who will be crowned the Extreme Improv Champion! This comes complete with a WWE style Championship belt, and harsh penalties for losers! 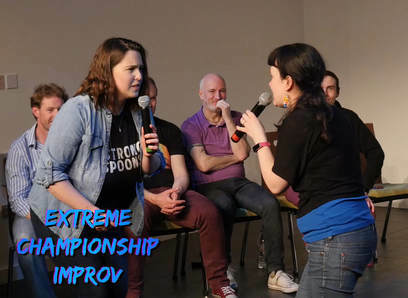 Performers battle with comedy to win the Extreme Improv Championship belt! Check out the Highlight Video of an Extreme Championship Improv show!